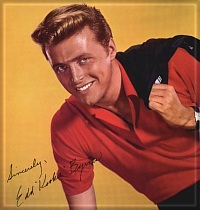 Edd Byrnes (aka KOOKIE) from 77 Sunset Strip is cool cool cool, daddy-o! Here seen teaching the Parisian kids how to swing. This entry was posted on January 8, 2006 at 5:22 pm and is filed under Rockabilly, Television. You can follow any responses to this entry through the RSS 2.0 feed. You can leave a response, or trackback from your own site.